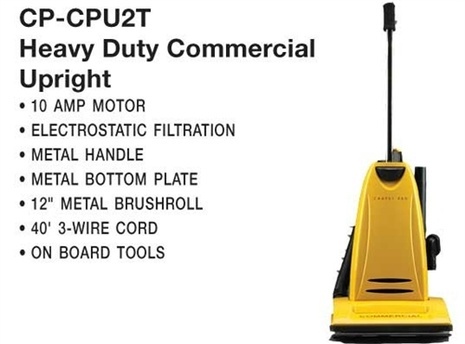 The Carpet Pro CPU-2T is lightweight, powerful and includes many convenient features. The last thing you want to do is damage the motor of your vacuum. The Carpet Pro CPU-2T has pre-motor filter located right above the motor to prevent any stray debris from hurting the motor. The Carpet Pro CPU-2T also uses a Motor By-Pass System which means all of the dirt goes directly into the bag and NOT through the motor. This means you can pick up a nickel or screw and not worry about braking a set of fans which is a common problem in many other commercial machines. The exhaust filter helps clean the air that is expelled from the machine. 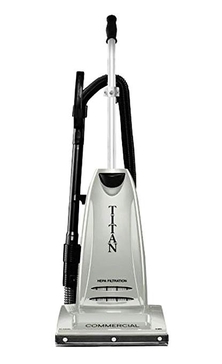 The Titan TC6000 Commercial HEPA Upright Vacuum with Tools On Board features a powerful 10 amp heavy duty commercial motor and 40 foot cord. In high-wear areas of the vacuum – the handle tube, bottom plate and brushroll are metal instead of plastic to stand up to years of use. The telescopic Power Wand with handle extends cleaning reach by 32 inches to clean shelves, corners and hard to reach areas. A crevice tool is included, plus a natural bristle dusting brush to gently clean baseboards and blinds. 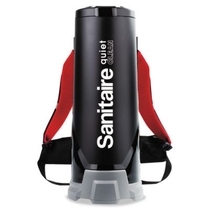 The Sanitaire SC530A is the best quality backpack vacuum Sanitaire has ever built. 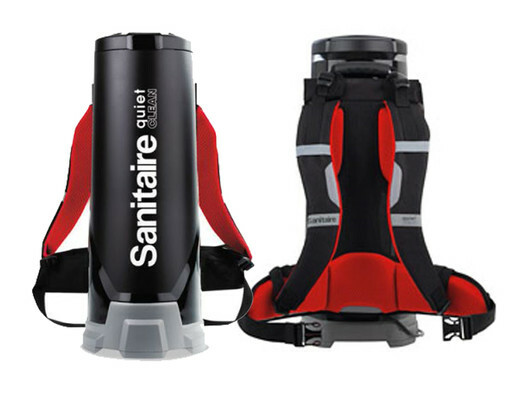 Its lightweight design helps users achieve a faster clean while limiting fatigue. 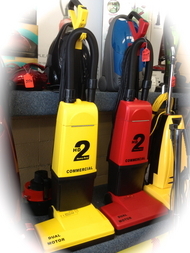 The quiet operating volume and high filtration levels make the vacuum great for daytime and nigh time cleaning tasks. 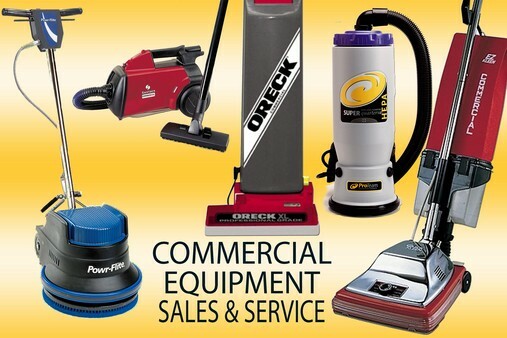 This commercial unit comes with a comfort harness and features a powerful 11.5 amp motor. This means lots of suction to the attachments, making any cleaning task a breeze. 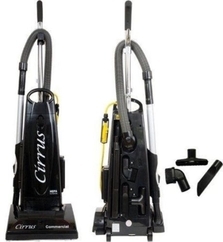 An extremely long 50" commercial cord and 5' hose give this vacuum cleaner an enormous cleaning radius.This means less time spent changing outlets and more time getting the job done. 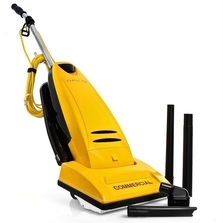 If your time is precious and your looking for a vacuum cleaner to help speed up your cleaning ability, the Sanitaire SC530A is for you. 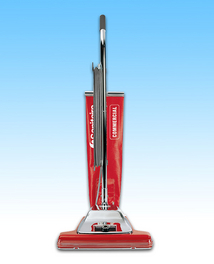 Sanitaire Red Line Eureka Upright Vacuum. Wide 16-inch or 12-inch cleaning path. Quick Kleen fan chamber. Vibra Groomer I brushroll. Chrome steel motor hood. Brilliant headlight. 50-foot power cord. UL listed for commercial use. Packed full of powerful, easy to use features, Sanitaire's commercial upright, model SC899, reduces cleaning time and is UL listed. This Sanitaire has a 16-inch cleaning width that allows the user to clean more in one pass than other commercial uprights. 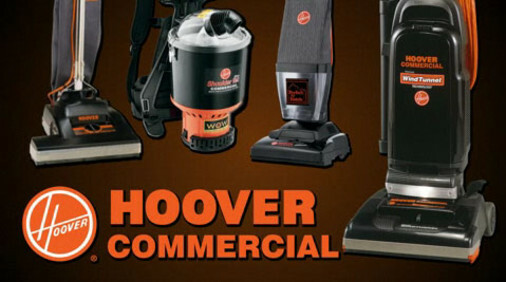 The exclusive Vibra Groomer I brushroll loosens dirt that is embedded into carpets. 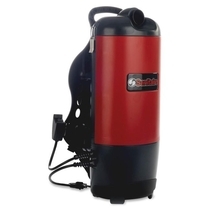 The removable Quick Kleen transparent fan chamber makes cleaning or changing the fan fast and easy. With a chrome steel hood, 50-foot power cord, 6 carpet level positions and a brilliant headlight, large rooms will be cleaner in less time. 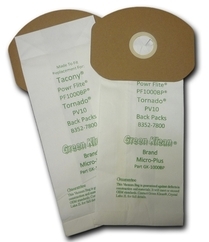 Shake-Out Bag System.